Would you look at that bottle! While the northern hemisphere has heat waves, Cape Town is stuck in the tail-end of winter. Even the northern parts of South Africa already have hot spring days, but down here at the southern tip, we still slog through (what we perceive as) coat weather. So when A Scent came around, I spritzed in-store with a sardonic twitch about the mouth and a wary trigger finger. And lo! There was love. And yes, I get that – A Scent is certainly strong, persistent and very present; even twelve hours after application I’m still getting compliments. But I also get the ‘minimalist’ thing: it doesn’t smell like a composed medley or a symphony of notes, but to me rather like a single thing, a pot of mulch-and-flowers, maybe. A moss patch with a single sprig of jasmine. Now, that’s sounding like there’s a whole lot of dirt in A Scent, and there isn’t (hey! why haven’t I layered it with Demeter Dirt!? Must remedy!). It is certainly just-showered clean, especially the first few hours, and the ‘crystal moss and musk’ in the base, yeah, they do say ‘hello, I’m a modern department store fragrance’. But boy, someone worked magic on this, because shower-clean is the LAST descriptor I look for in perfume. I could not have imagined even being able to tolerate A Scent by looking at the notes (lemon verbena, galbanum, jasmine, hyacinth, cedar, crystal moss and musk), but here I am, loving it. It’s one of only two perfumes I’ve ever had to buy a second bottle of (the other being the original Omnia, which I promptly fell out of love with after buying my second bottle, and a 100 ml at that). Not only that, my current, second bottle of A Scent is a gigantic, preposterous 150 ml – and I believe I’ll see its end, too. There’s a certain something to buying a veritable vat of perfume when you know you’ll really use it. And come on, that brick of an icy bottle is a stunner! 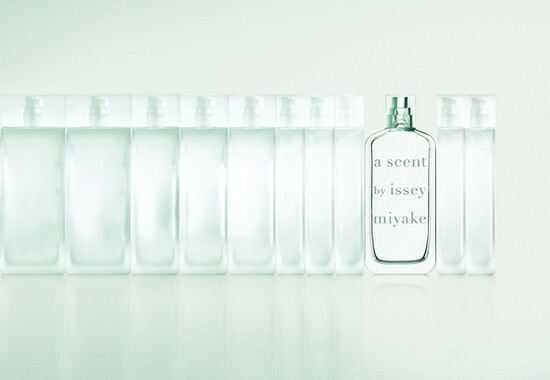 Aside: I was most, most distressed to look at the Issey Miyake website to find that the only A Scent shown on the main page there is in the pink Florale bottle . . . without the Florale tag. They simply call it A Scent EDP, while, if you search for it on the site, the EDT is still the green beloved of mine. Strange . . . taking a quite different flanker and making it the EDP. If they discontinue the EDT . . . So why do I hear so little about A Scent? It seems to me perfectly calibrated to the (so we’re told) American love of clean-smelling perfumes. I don’t often see it on best of summer lists, I can’t remember when last I saw a mention of it … what gives, People Who Currently Have Summer? Are any of you wearing it? Has anyone smelled the Soleil de Neroli version – worth it? I thought the Florale flanker was most heinous (shades of L’eau! ), but maybe the Neroli would work in a cologne-like way. What say you? Back before I mustered the courage to order decants, I was buying full bottles without trying them first. A Scent was one of them. I didn’t hate it but I really disliked it when I first put it on. Later on and a few perfumes later, I know why, I don’t really care for a lot of citrus in perfume. The bottle may be plain but it is cool looking. Hello, Hester! Glad to hear you’re taking a break from winter scents — that’s always refreshing and a nice change for your nose. I really like this Issey as well. Now that you mention it, I haven’t seen it in awhile, but will have to look for it next time I’m in the big city. Oh Hester…..how I deeply admire your ability to wax so lyrical about scent, I love them but never think so deeply about them…. and I also admire your living in Cape Town – what a stunning place in the world! Thanks so much! And yes, we appreciate living in Cape Town every single day. I love A Scent. Because I am a perfume snob, I often feel vaguely ashamed of loving anything that (1) is easily available in many different department stores AND (2) was created less than, oh, thirty years ago AND (3) smells as if it were created less than thirty years ago (Estee Lauder Jasmine White Moss, for example, smells like the 1950s to me) AND (4) doesn’t smell as if it could be worn by a Cylon. It just is that good! Luckily I don’t smell it on people often; that’s my main snobbery (if it IS about snobbery, I’m not sure): I can’t stand it when others around me wear ‘my’ perfume. Mean, I know! Oh yeah, count me in – I’m a fan of this one, too. It’s my summer staple, together with Gucci’s Envy and Chanel’s Cristale, it’s a pretty green crispy floral, evocative of summer heat and white cotton sneakers. It was today that I rearranged and dusted my fumes collection, to bring out the fall & winter potions and put the likes of ‘A Scent’ further back in the closet, ’cause summer is gone for good in Europe – ah, I already miss it!. Oooh, Zara, I am so with you on the Envy and Cristalle — such lovely green goodness! Crikey! I’m going to give this one another sniff. I can’t remember why I disliked A Scent when it came out, and that is always a sign you should re-test something. Summer is on its way here so now would be a good time. Anyway, wonderful review of A Scent. I am chuckling at your ‘preposterous’ 150 ml bottle. There really is something to be said for things you can buy just about anywhere! Shipping to South Africa can be a pain, too. Loved the story of a new love found in an unsuspected place. I have never smelled A Scent or any Issey for that mater… The house just never called to me. But now I am intrigued to see what you fell for. Oh and as an American I have to say I am sooooooo over the fresh clean just of the wash line in the backyard on a breezy spring afternoon oh aren’t we all just so spanking clean and pristine fragrances. Give me some skank and a strong dose of smoky leather and burning temple incense and I am on the hot tamale train to Perfumville. And sometimes I like a perfume to hit me like two yellow cabs in a collision on Broadway and 42nd street. Pow baby here I am! I am with you! I find a spritz of Demeter Dirt improves almost any perfume. I never tried this scent because my all time favorite is Chanel 5 but since I came across this blog of yours, I came interested in trying it out. How much does it cost? I’ve seen it online for really quite inexpensive amounts, but in South Africa it is pretty pricey – I believe I paid about R1000 for my 150 ml bottle. I’ve read some rhapsodic reviews of this, but I’ve been blinded by the reaction I had to L’eau d’Issey – instant, awful scrubber. Sounds like it’s time to give this one a try. Thanks Hester!